Hitler | Why Not Train A Child? Poor Debi Pearl, she is so confused. It is so very sad. She considers our warnings against her and her husband’s teachings to be a lie, akin to the lies Hitler told. 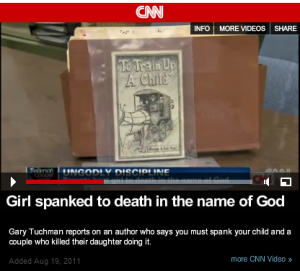 She states in this article that the parents who killed their children never read their books and that they were not found in their homes. How can she really believe that when the official documents (*trigger warning*) say that they did find their books*? Not only that, but many friends of the families have confirmed to me that they were avid Pearl followers who not only recommended their books but even gave them away. I have explained our problems and concerns with their teachings over and over again and can only assume that they are so sure that they are lies that they don’t even read them. There are none so blind as those who will not see. *The link above marked trigger warning is the sheriff’s affidavit of what was found in the Williams house. 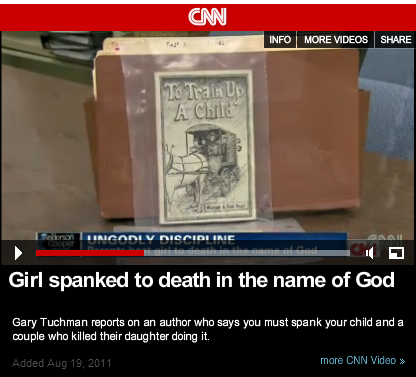 The CNN report says that the book To Train Up A Child (shown in my featured image) was found in the Schatz house.